We have replaced the Core Block with a Core Block Cardlist. This replaces a list of expansions that make up the Core Block with a list of cards that are allowed to be used in every block. This list will always be easy to find (it's currently on the front page of the site) to aid Block deckbuilding. In addition, cards that are in the Core Block Cardlist will have that indicated on their card page. A Virtual Expansion released on 2018-10-26, containing 18 new 1E cards. Twelve years ago, humanity's first steps into the galaxy made their debut in First Edition with the Enterprise Collection. Over the years, much has changed with the Starfleet affiliation but the importance of these first eighteen (18) cards hasn't faded. 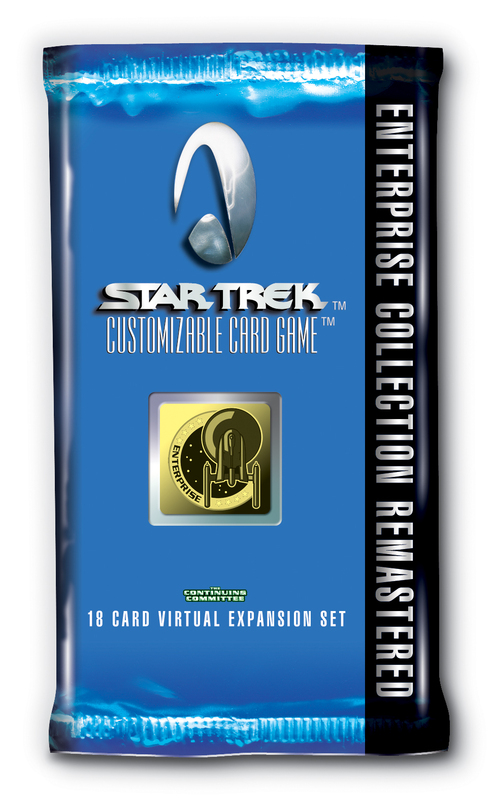 Now, with the release of the Enterprise Collection Remastered, these classic cards get new life with updated icons, game text, and high resolution images for a new era of First Edition. 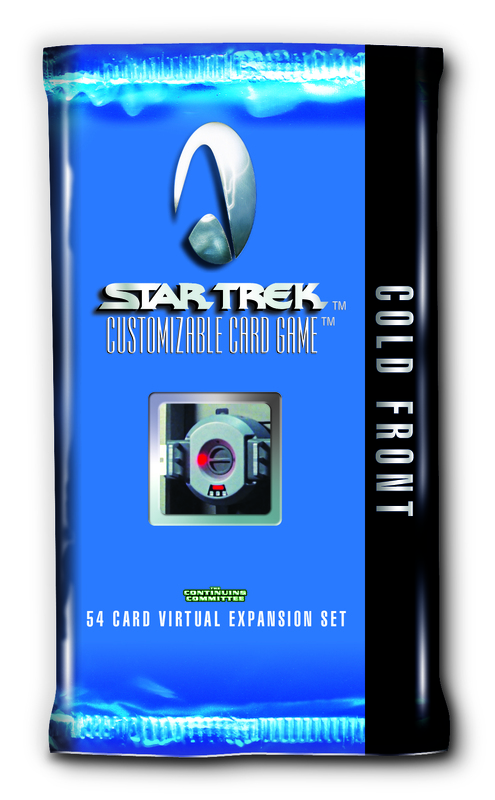 Your Starfleet decks will never look better! A Virtual Expansion released on 2018-01-12, containing 56 new 1E cards. Shadowy threats from across time and space take center stage with Cold Front, a new fifty-four (54) card expansion for First Edition. With Cold Front, you can take on the role of a temporal benefactor, manipulating events in the past towards unknown future goals. Or you can pilot the enigmatic Romulan Empire, the augmented supermen, or dens of thieves and scavengers towards political power, conquest, or the lust for profit. No matter your aim, you'll find something to leverage in Cold Front! A Virtual Expansion released on 2017-09-01, containing 66 new 1E cards. After making first contact and acting out of fear, Vulcans spent a century hindering Earth's progress. Explore this period of Vulcan obstruction and interference with Live Long and Prosper. Featuring sixty-two (62) new First Edition cards, you'll find lots of dirty tricks to hinder your opponent’s efforts. These aren't the logical, stalwart allies of the future; they're manipulative and driven by fear. Can you use these cards to help the Vulcans find their way to Live Long and Prosper? A Virtual Expansion released on 2017-06-23, containing 18 new 1E cards. Join us in seeking Kolinahr with the Pre-Warp Pack, an expansion previewing the all-new Vulcan affiliation. With these eighteen (18) new First Edition cards, you'll be able to unify the Vulcan species across all of time and space into one exciting deck. Enjoy this exclusive preview of Vulcans with the Pre-Warp Pack! A Virtual Expansion released on 2017-03-31, containing 90 new 1E cards. Retrace the first tentative steps of humanity into the galaxy with Broken Bow, a new First Edition virtual expansion from The Continuing Committee. 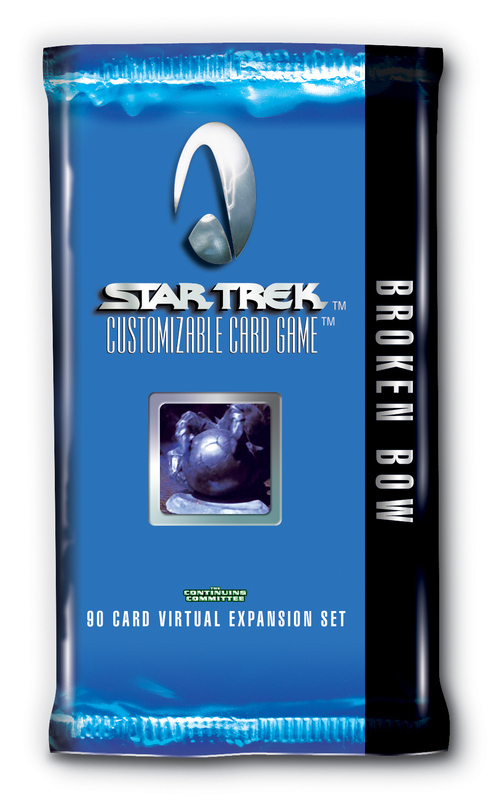 Featuring ninety (90) new cards from the 22nd-century era of Enterprise, Broken Bow gives players new options down the path of Starfleet exploration or Klingon conquest. However, there are great dangers in the galaxy no matter which path you choose - and plenty of new dilemmas to represent them! Venture forth into Broken Bow, and know the galaxy will never the be same again. 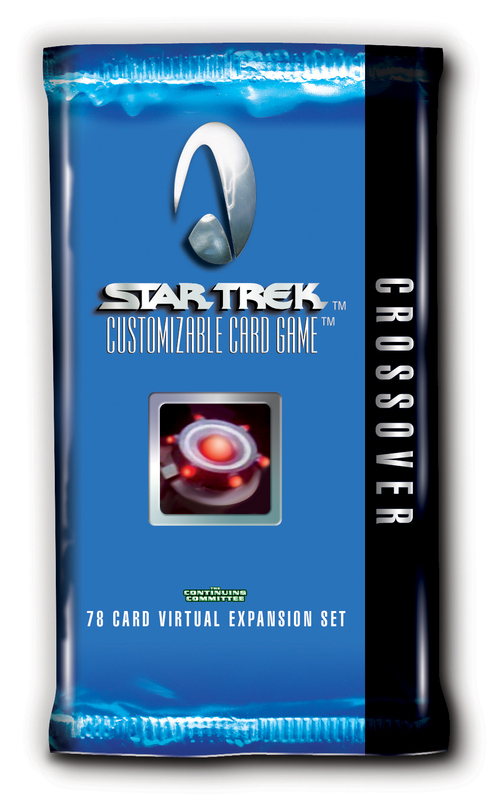 A Virtual Expansion released on 2016-11-25, containing 64 new 1E cards. 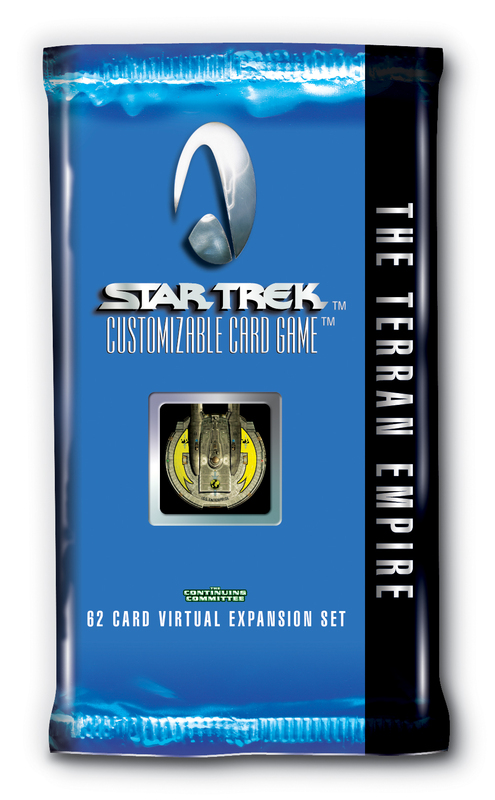 The Continuing Committee is proud to bring you The Terran Empire - a sixty-two (62) card First Edition virtual expansion. Celebrate the birth of the Imperials in the Mirror Quadrant with the final expansion in the Mirror Block. Players will have many options in the dark alternate universe. Follow a lowly member of the crew through promotions and deception until they become Emperor (or Empress), or perhaps take command of a futuristic starship and use it to dominate the spaceline. Use the tools around you before they disappear, and try to get by with limited resources in your hand. The Mirror Quadrant is not a place for the faint of heart! A Virtual Expansion released on 2016-03-25, containing 54 new 1E cards. Experience the power, glory and brutality of the Terran Empire at its peak with this fifty-four (54) card First Edition virtual expansion. Travel through time, intimidate worlds, and infiltrate the other side. Will you change the course of history - or find yourself a prisoner in a dark and sinister universe? When you step Through the Looking Glass, there may be no going back. 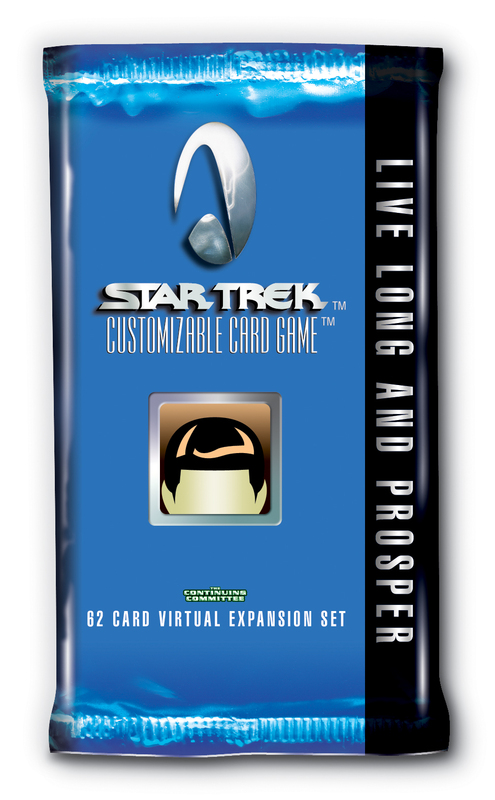 A Virtual Expansion released on 2015-09-25, containing 80 new 1E cards. Venture back into the dark and twisted mirror universe with Crossover, a seventy-eight (78) card First Edition expansion that details the conflict between the Klingon/Cardassian Alliance and the Terran Rebellion. Crossover brings new opportunities to players with new objectives, and greater threats with a suite of lethal dilemmas that will find homes in many different decks. Are you prepared for the mirror universe? Are you prepared to Crossover?